Jess Humphrey (MFA, CLMA, RSME) is a dance artist and teacher. Her movement research began in childhood with competitive gymnastics, and continues today with dancemaking from various, shifting perspectives and states of body~mind. Her dances are expressions of her engagement in contemplative and somatic practices, Integral Theory, and her situation within the western, theatrical dance lineage. She has an MFA in Modern Dance (with a focus on contact improvisation and creative process) from the University of Utah and a BFA in Dance from California State University, Long Beach. She completed the Integrated Movement Studies (IMS℠) program and was certified as a Laban/Bartenieff Movement Analyst (CLMA) by Peggy Hackney and Janice Meaden in 2006. She is currently a Registered Somatic Movement Educator (RSME) with ISMETA (International Somatic Movement Education & Therapy Association). IMS℠‘s somatic approach to the Laban work inspires her continued studies with Bonnie Bainbridge Cohen and Amy Matthews (Body-Mind Centering®), Kristen Baum Wilcox (Feldenkrias Method®), and Marjean McKenna and Eileen Troberman (Alexander Technique). An intensive study with Deborah Hay in 2009 changed her life and continues to inspire her every move. 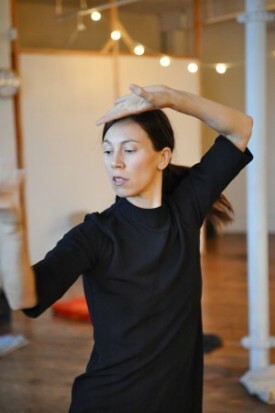 She is currently practicing and performing with LIVE (Dina Academia Apple, Kris Apple, Liam Clancy, Anya Cloud, Ron Estes, Eric Geiger, Blair Robert Nelson, Mary Reich, Karen Schaffman, and Leslie Seiters), making work with Eric Geiger, and collaborating with Leslie Seiters/Little Known Dance Theater in San Diego, California. She has also worked with Gabor Tompa, Sara Shelton Mann, Guillermo Gomez-Pena’s La Pocha Nostra, gogovertigoat in the work of eunkyungkim, and Nugent Dance in Los Angeles, and Core Dance Theatre in Idaho. In 2002, she certified in Pilates with Karen Clippinger and Rael Isocowitz (Body Arts and Sciences, International). She presented a paper at the 17th International Association for Dance Medicine & Science (IADMS) conference in Australia in 2007 called “Embracing thoracic convexity in the quest for verticality”. Jess continues to learn by teaching at San Diego State University, and has also enjoyed teaching and directing work with students at UCSD, CSUSM, and MiraCosta College. For the past two summers, she has co-facilitated Practice: a dancing intensive in San Diego. She also teaches contact improvisation and co-facilitates the weekly Contact jam in San Diego at Stage 7 School of Dance with Anya Cloud, Tim Richards, Ron Estes, and Leslie Seiters.